For the past week, I’ve been testing ZzzQuil Pure Zzzs, which is the latest sleep aid sold under the Vicks brand. The active ingredients are melatonin, valerian, chamomile, lemon balm, and lavender. It’s important to note that this version is different from ZzzQuil Nighttime, which contains an anti-histamine sedative instead. The short summary is that they seemed to work well for me, as has been my experience with melatonin in the past. But it’s hard to know how much was down to the sleep aid, and how much the placebo effect (or both). And my main criticism is the sugar content – 5 grams per dosage. 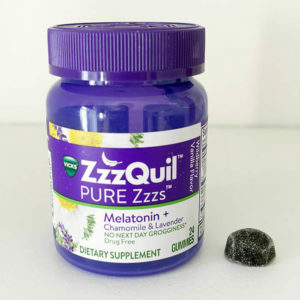 In this review, I’ll talk about both my experience trying ZzzQuil Pure Zzzs. And I’ll also take a closer look at the ingredients and safety advice if you plan on using them too. The instructions tell you to take one to two gummies 30 minutes before bedtime. I took two, immediately noting that they both taste good and are very sugary. Each gummy has 2.5 grams of added sugars, so five grams in a full dosage. I’m not a fan of adding sugar to sleep aids – not only does it make you want to brush your teeth again if you already did, but I think it makes them too appealing to children. On the plus side, the melatonin content is 2 mg, which although still higher than some sleep experts would recommend, is more reasonable than the huge 10 mg dose that some sleep aids have. 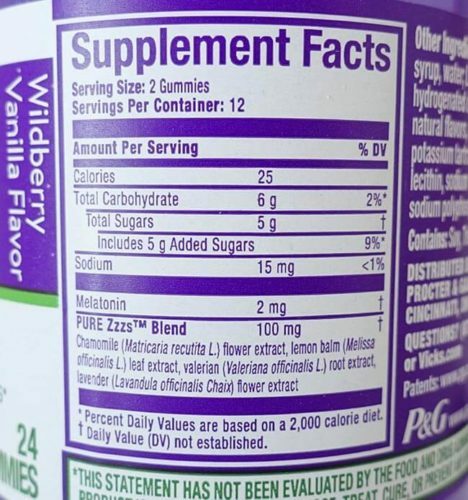 And there’s also the 100 mg blend of botanicals (see ingredients below). After taking them, I read in bed for a while. I do feel I was a bit drowsy after around 40 minutes, though I was tired anyway so can’t be sure it was the Pure Zzzs. But that night, I slept very well – 7.5 hours in total, with no significant wakings. So I was happy about that. As far as I could tell, I had no side effects that night. No vivid dreams (a possibility with the ingredients of melatonin and valerian). I had no fuzzy head in the morning either, as is often the case with prescription sleep aids and over the counter anti-histamine-based sleep aids. I took the same dosage around the same time for the next three nights. And again, I slept reasonably well each night, and with no side effects. On night five, I slept well, but woke with an unpleasant headache. Now, I did work out hard in the gym in the evening, so there’s a chance I was a little dehydrated during the night. But I don’t usually get that kind of headache though, so I suspect the ZzzQuil Pure Zzzs had something to do with it. After my headache during night five, I wondered if it was the beginning of ongoing side effects. This sometimes happens with sleep aids – you’re fine for a couple of nights, but once any side effects begin, they tend to continue or get worse. However, I had no repeat of the headache or any other side effects. So either it was a one-off or perhaps down to my gym session. In terms of my sleep, I did wake up a little more often than the previous nights, and my total sleep started to drop down again. Whether I was building a tolerance to them or there was another explanation is unfortunately impossible to say. I took ZzzQuil Pure Zzzs every night for seven nights and slept well for the first five. The effect lessened towards the end of the week, but it’s not clear why this was. There was only one night with any side effects – a headache – which is better than many other sleep aids. They often leave you with a fuzzy head in the morning (and sometimes all day), so it was good to wake up feeling refreshed and ready to start the day. I don’t like the sugar content though, and would personally avoid them in the future purely based on that point. And if you have children in the house, I would keep these well out their reach as they look, smell and taste exactly like sweets. I have to admit, I’ve tried melatonin sleep aids before, and have had good results from them. 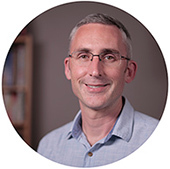 So I’m aware that my positive expectation – i.e. placebo effect – may play a role when I test a new one. I’ve also found that the herbal ingredients valerian and chamomile have a mild sedative effect for me. And since I’m not wired up in a sleep lab when I test a sleep aid, and rely on sleep tracker data and my observations, the outcome is a subjective review. So please bear in mind that you might not have the same experience as me if you decide to try them. At the time of writing, ZzzQuil Pure Zzzs are sold on Amazon, with more than 300 customer reviews. It has 4.1 out of 5 stars, and although most give it 5 stars, there are still many who give it just 1 or 2. Those who give it 4 or 5 generally say it just helped them sleep, with some also mentioning vivid dreams. Those who give it 1 or 2 stars tend to say it didn’t work at all for them, or that they had bad dreams. And there are some who also complain about the high sugar content and taste. If you look on the Vicks website (not an affiliate link), they have a smart label for their ZzzQuil products, with brief notes about what each ingredient does. The bottle I bought had no warnings of possible side effects. I also couldn’t find any on the Vicks website, or any online stores where it’s sold. For more information, you can also read my article about melatonin dosage and side effects. And I’ve written articles about the sedative properties of chamomile and valerian. Have you tried ZzzQuil Pure Zzzs? Let me know in the comments what your experience was this sleep aid. Did it work for you? Did you have any side effects?